For other uses, see Plus Ultra (disambiguation). Plus ultra[note 1] (English: Further beyond) is a Latin phrase and the national motto of Spain. It is taken from the personal motto of Charles V (24 February 1500 – 21 September 1558), Holy Roman Emperor and King of Spain (as Charles I), and is a reversal of the original phrase Non terrae plus ultra ("No land further beyond"). [note 2] This was said to have been inscribed as a warning on the Pillars of Hercules at the Strait of Gibraltar, which marked the edge of the known world. Charles adopted the motto following the discovery of the New World by Columbus, and it also has metaphorical suggestions of taking risks and striving for excellence. The motto was suggested to the young king in 1516 by his physician and adviser Luigi Marliano. It was emblematic of Marliano's vision of a Christian empire spanning beyond the boundaries of the Old World. It was associated in particular with the desire to bring the Reconquista past Gibraltar and into North Africa: at Charles's triumphal entry into Burgos in 1520, a triumphal arch was set up bearing on one side the motto Plus ultra and on the other "All of Africa weeps because it knows that you have the key [Gibraltar] [and] have to be its master". The motto is first recorded on the back of Charles's chair in the church of St Gudule, Brussels. The original French motto Plus oultre was translated into Latin due to the hostility Spaniards bore for the French advisors and ministers Charles brought with him to Spain. The motto continued to be popular in Spain after Charles V's death. It appeared in Habsburg propaganda and was used to encourage Spanish explorers to ignore the old warning and go beyond the Pillars of Hercules. Today it is featured on both the flag and arms of Spain. The French built the Lines of Ne Plus Ultra which they hoped would stop the army of the Duke of Marlborough during the 1711 campaigning season in the War of Spanish Succession, but his army breached them without loss. The motto is used in Veracruz State in Mexico. The motto is used in the logo of Trompsburg Primary School. The motto is used by a number of institutions around the world, including the National University of San Marcos, the University of Mexico, Shepherd University, the Colombian Navy, St Peters Lutheran College in Indooroopilly, Queensland and Immanuel College (Australia) in Adelaide, South Australia. The English philosopher Sir Francis Bacon used it as his personal motto. The French version Plus oultre is the motto of the Belgian city Binche and of the US Air Force Academy's 15th Cadet Squadron. 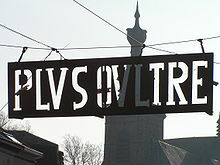 Charles V was born in Ghent in Flanders and as a result the motto is also used in this region. In 1926 a crew of Spanish aviators including Ramón Franco and Julio Ruiz de Alda Miqueleiz completed the first transatlantic flight between Spain and South America on a seaplane named the Plus Ultra. 1930 saw the formation of a Madrid-based football team AD Plus Ultra, which eventually developed into Real Madrid Castilla. The Plus Ultra Brigade, composed of troops from five Spanish-speaking countries (Spain, the Dominican Republic, Nicaragua, Honduras, and El Salvador), served in the Iraq War in 2003. 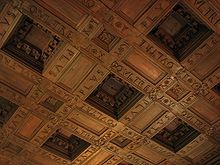 The motto is written on the wall tiles of the cloak room at Mar-a-Lago, President Trump's retreat in Florida. It is used in the manga and anime series My Hero Academia as the motto of the hero academy U.A. High School. It is the name of the second volume in the light novel series The Saga of Tanya the Evil. Plus Ultra Society is used in the 2015 movie Tomorrowland for the name of the group of people responsible for creating a better tomorrow, further beyond. The founding members of this fictional group were Gustave Eiffel, Nikola Tesla, Thomas Edison, and Jules Verne. The motto is tattooed on the arm of one of the playable characters in the 2019 videogame Apex Legends, Octane. Additionally, Non terrae plus ultra is one of Octane's possible voice lines for entering the battle. ^ Also Ne or Nec plus ultra, "no further beyond". ^ Giovio, Paolo (1658). Diálogo delas empresas militares y amorosas, compuesto en lengua italiana. ^ a b c d e Ferer, Mary Tiffany (2012). Music and Ceremony at the Court of Charles V. The Boydell Press. ISBN 9781843836995. ^ Donald J. Trump [@realDonaldTrump] (18 January 2017). "Writing my inaugural address at the Winter White House, Mar-a-Lago, three weeks ago. Looking forward to Friday.…" (Tweet) – via Twitter.